Haha. Geeks! 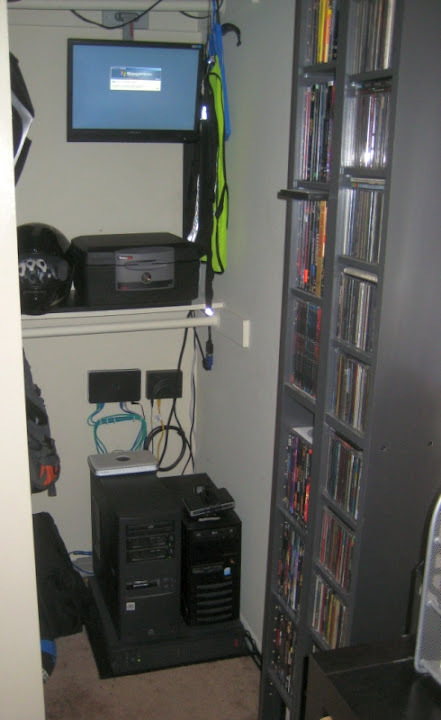 All of our stuff here at casa de la foxx 'n moot is in a closet upstairs in an area I turned basically into a dedicated server/networking area. I've had (and still have) huge 24 and 48 port switching monstrosities but really found them to be too noisy and consume too much power to be so under-utilized in the home and be practical, and they've all only been 100bT. Too slow. Right now we've got an 8 port Gig-E switch that only has four things plugged in to it. Could swap it out for one of the managed 8 port Gig-E switches I have in the garage, but don't see the point until we have far more multimedia moving around the house; like, several high-def streams at once. Server on the right, my PC on the left, UPS below. Cable modem on the right, Gig-E switch on the left, current router/WAP on top of server to be replaced with the router sitting on top of my PC at some point in time since the wireless has been dying for about 6 months now and requires regular reboots. Yes, it's the same one I think you bought when you lived with Steve and Kit!